Summary: This can’t be good! Suddenly Suze’s mom wants back into her life, and her teacher wants her to “try harder”?! As if middle school wasn’t hard enough, Suze Tamaki's life gets turned upside down when her mother reappears after a ten-year absence. Once Suze gets over her shock, she thinks it might be cool to get to know her mom. But her older sister Tracie is determined not to let her back into their lives. At school things aren’t much better. 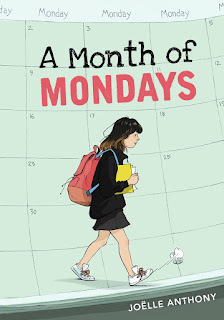 One of her teachers decides the way to cure Suze’s lack of motivation is to move her into Honors English – a development Suze finds both inspiring and distressing. When she's paired with straight-A student Amanda on an English assignment, she finds herself caring about people’s expectations like she’s never done before. Suze Tamaki is literally just coasting through middle school, trying to survive rocky friendships, bad dye jobs, and a principal who is out to get her. Her English teacher pairs her up with an Honors English student to work on a project. When Suze and Amanda find out that the school system is planning to get rid of their beloved custodians, the two girls turn saving their jobs into their English project. And if everything goes well, Suze will get to stay in Honors English- something that she desperately wants (it also scares her to death). Adding to that stress is the reappearance of Suze's mom who left the family when Suze was just 3. While Suze wants to give her mother a second chance, older sister Traci is adamantly against it and resents Suze for her decision. This is a pretty realistic story about not just growing up but also family ties. The characters were well thought out and the plot was solid. I loved the way it wrapped up and the decision Suze made about how much she influence she was going to allow her missing mother to have on her life. I've read a lot of stories where the child just fully forgives the parent who walked away, so it was nice to see a story where the child acknowledges their hurt over being abandoned and taking steps to protect themselves. It was a lovely middle grade read but I would definitely recommend this to all realistic fiction lovers.